Author David E. Scheim says in his prologue "A clearly presented, flawlessly documented exposé of who performed the murder is all that can justify yet another book on the much-confounded Kennedy assassination riddle." Scheim's words accurately describe the scope of his own contribution to the assassination canon. 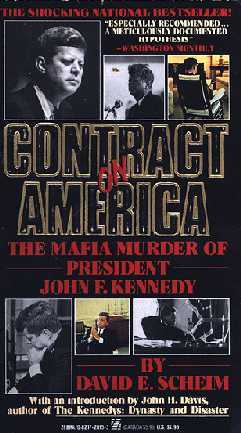 With Contract on America (Zebra Books, $4.95), the author uses the Warren Commission's own documentation, combined with evidence presented from the 1979 House Select Committee on Assassinations and a multitude of other sources, to provide a compelling casewith the Mafia as prime suspect. Jack Ruby is Scheim's main target. Through his highly dubious past, his confirmed allegiance with known mobsters, and questionable contact with Dallas law enforcement, Ruby is portrayed as a Mafia tool in a conspiracy stretching from Dallas to New Orleans, Chicago, New York, and even Cuba. Ruby's own testimony, documented by the Warren Commission and witness accounts, is fraught with inconsistencies and veiled hints at a larger web of deceit. The tale is a chilling one. Lee Harvey Oswald is only the most infamous death in the wake of JFK's assassination; numerous witnesses, reporters, even lawmen are murdered or die under "mysterious circumstances" in the months and years that follow. Scheim presents a world where people that talk have a habit of turning up dead, where graft and corruption are rampant, and where no oneincluding the President of the United Statesis immune from Mafia vengeance. Scheim's work is as thorough as it is provocative. While the overall effect at times reads like a legal brief (there are a total of 4,227 endnote citations in the work), the end result is a frank discussion of Mob culpability and political expediency. The good news is that Scheim has authored a book that deserves praise for its scope and detail. The bad news is that the closer we seem to reaching the truth about what happened in Dealey Plaza, the more painful and elusive the truth seems to become.